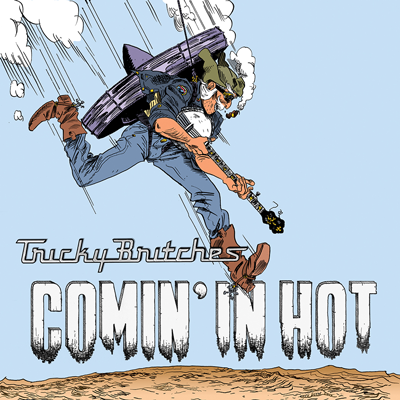 Portland’s Tricky Britches channels a classic bluegrass sound — sans porkpie hats. Now that we’re 16 years into the bluegrass and old-time “revival” prompted by the soundtrack to the 2000 Coen brothers film, O Brother Where Art Thou?, maybe the music isn’t so much revived anymore as simply living and breathing. Zombies are revived, but they don’t mature or evolve or create, really — just shamble around, repeating old, tired lines about brains. But old-timey string music has spent a decade-plus whirling off in new directions, the most conspicuous of which is (arguably) the rustic, emotive folk-pop of bands like the Avett Brothers, Mumford & Sons, or Boston’s The Ballroom Thieves. At its best, this subgenre has introduced millennials to the range of, say, fiddle and mandolin; at its worst, it’s given us overwrought, banjo-driven anthems and press photos of waxed-mustache twentysomethings wearing tweed vests and porkpie hats. Portland’s Tricky Britches formed in 2009, and given as they’ve watched porkpie-pop blow up, they’re refreshingly traditionalist. The original tracks on their new record, Comin’ in Hot, sound like Bill Monroe wrote them 60 years ago — tight, fiddle-forward tunes on a micro-album that clocks in at just 19 minutes. Standout tracks include “Jackson Square,” a driving reel a la Sam Bush, and “Allagash,” a classic bluegrass breakdown, or rapid-fire instrumental in which banjo, fiddle, and mandolin trade the lead. Tricky Britches plays the odd Portland bar gig, but the band’s July touring schedule suggests where their music really lands — a meetinghouse in Otisfield, a barn dance in South Hiram. This is bluegrass for an old-school crowd. Just don’t call it a revival.